A new version of Windows 10 is upon us containing exciting new features to make users more productive and secure. The Windows 10 Spring Creators Update version 1803 builds on the Fall Creators Update launched last October. New features include: Time Line for managing apps and activities across devices; redesigned settings app, new user experiences for installing fonts, using Bluetooth, Audio and whole lot more. In this article, we look at how to upgrade from a previous version using Windows Update. 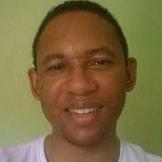 Its not that different from previous versions, but users will note how much faster and stable the process is. Anyway, lets dig in. Step 2: Windows Update will scan for a new version then begin downloading the feature update. Step 3: The download can take some time, so be patient. If you don't see any progress after an hour, try disconnecting from the Internet temporarily, then reconnect to see if it progresses. If not, restart your computer then try again. Step 4: After the update is finished downloading, it will begin installing. 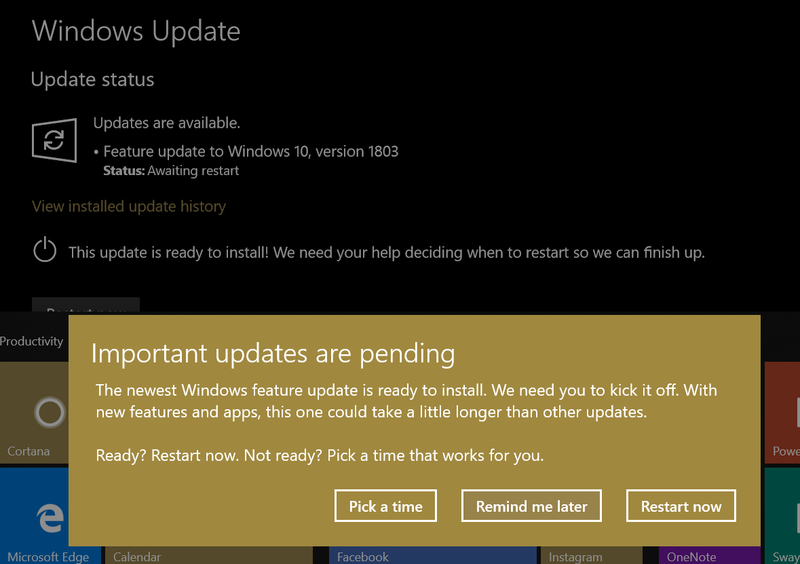 Step 5: When the installation is ready, Windows Update will notify you and ask if you would like to install now, choose a time or set a reminder. If you are not ready to install yet, click 'Pick a time'. 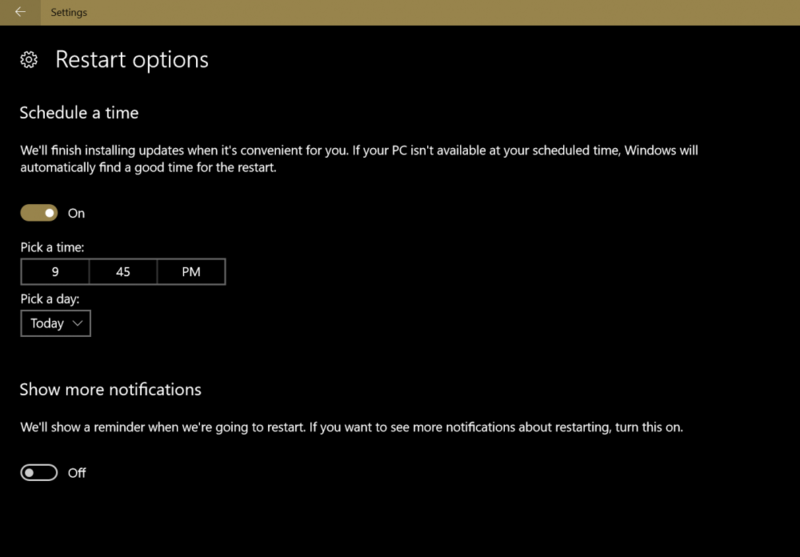 This will open the Restart options setting in Windows Update. Proceed to choose an appropriate time and day that is suitable for you. When complete, you can sign into your account and check Windows Update. Thats it, you don't even see the old installing apps screen anymore. Please be advised some devices might experience issues upgrading to Windows 10 1803. Here are a list of things you can do to ensure your upgrade is successful or you can return to your previous version. What is the make and model of your computer? Have you checked the manufacturers website to determine compatibility? Let us know in the comment how your upgrade goes. Using the Windows Update, the order of operations was different for me. After finding the update, The first screen was "initalizing". Second was "preparing to install" counting to 100%. Third was "downloading" counting to 100%. Fourth is "installing" (and currently counting). 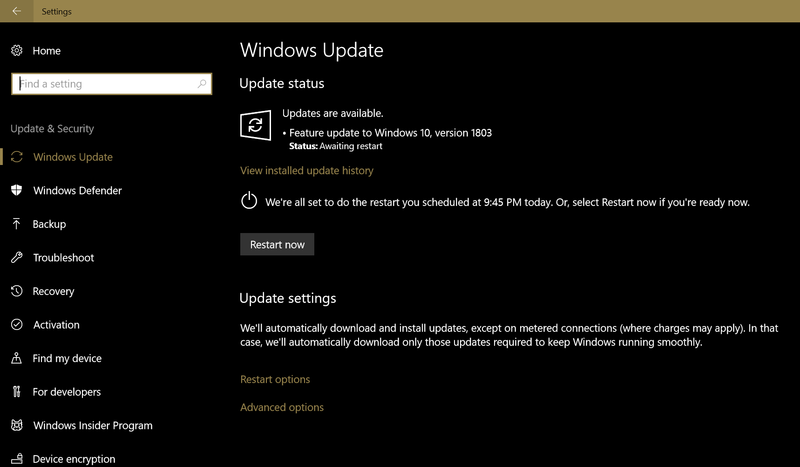 I assume that the restart process will prompt me after the installation. Note - I have tried this 3 times before, and all failed. This time I turned off McAfee and disconnected from the internet upon the fourth step. It appears to be working, but we shall see. Well it worked, although it gave me some strange reboot activity. Bottom line - it would be a good idea to include suggestions in the steps above concerning anti-virus software and internet connectivity. How do you re-attempt the update if it fails? At present re-running windows update does not seem to do anything. 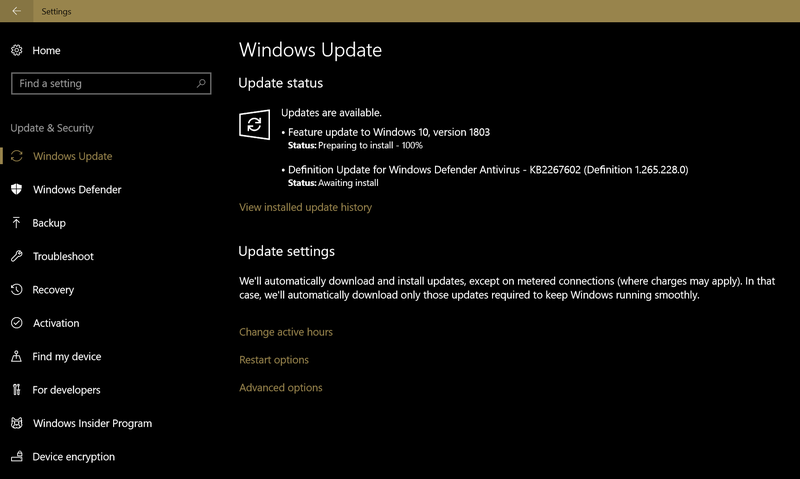 Update to 1803 didn't go well for me. Long press (10 - 15 seconds) on power button now required to turn on my pro 4. Battery at 100% when shutdown, becomes a flat battery overnight. Touchscreen and touch pen not working at all. Both functioning normally before update. SurfaceME has a driver won't start problem, can't commit code that is being written to memory. Typecover backlight has stopped working. Firmware update that fails to install no matter what I try. I've tried every suggestion on the Microsoft website to resolve these issues. I've even reimaged back to 1703 then updated again from there. Still no solution to the problems. I've had three call with 2 different Microsoft support agents. Basically 1803 has reduced my pro 4 to a desktop. I faced a problem while installation. My Acer laptop used to crash sometimes when using the program. Although, eventually I sorted out this problem with Acer Customer Service It suggested to reinstall the Program. 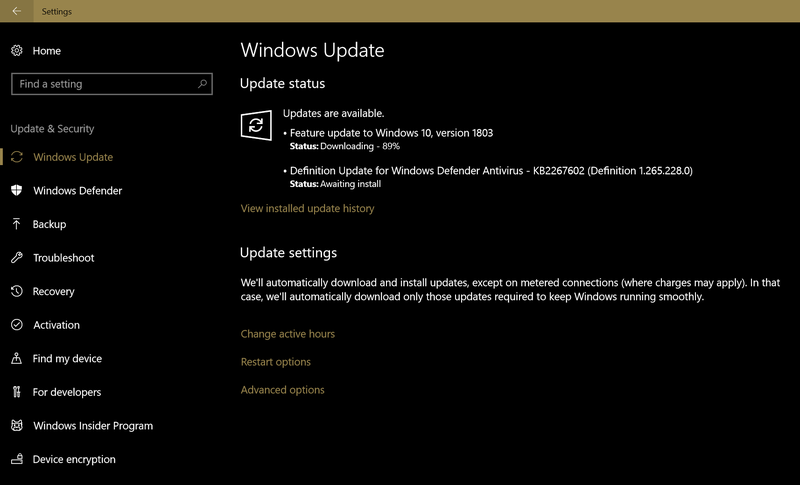 This self windows auto update is not possible in my office IT range as I'm having more than 1000 client systems. Also Microsoft is releasing frequently new versions in windows 10 like android. Is it possible to upgrade windows 10 versions 1511/1607/1703 to 1809 in OFFLINE. Greetings and Salutations...(not to mention) HAPPY HOLIDAYS! What prompted me to write this posting is that I saw that there was some questions on how to get the Microsoft servers to cough up an off-line ISO of the Windows Update without going through the "official" Windows Update through the front door like Microsoft wants you to. I hope this helps. I have and I have done it on my computers that needed both the Spring (April 2018) and Fall (October 2018) updates for Windows 10 when I had to do a fresh installation of Windows 10 to my Mom's Asus notebook. I also did the fresh installation via a micro-SD card via a RockeTek (search Amazon.com for micro-SD card readers) USB 3.0 reader and made the micro-sd card bootable with my MS Office 2016, windows drivers for my ASUS, other programs like my browser, etc., and of course, my two updates (although if I remember correctly I might not have needed to install the Spring Creator's Update (April 2018) when I read through these articles along with a couple of the many links peppered through them: How to Download Official Windows 10 ISO files Using Media Creation Tool or Directly Using your Web Browser and How to Download the Latest Windows 10 ISO Files Directly Using Your Web Browser both by Andre Da Costa. The following will work not only for the Firefox Quantum editions (like the version that I use), but for all browsers. 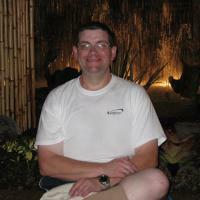 Within all web browsers, there is an item called a USER-AGENT, it is just a unique text field. For those of you who do not know what a user-agent is it defines to website (and other) servers what flavor of web browser base you are using (ie - Mozilla/5.0); Operating System (OS - ie Windows 10); what base is the current OS (Win 10 is a Windows NT base 10); what type of "bit" system you are using (32-bit or (WOW)64-bit); what revision (version) of browser you are currently implementing at the present time (rv:65.0); and, lastly what engine ("brain") it utilizes to orchestrate and place the images, text, etc. upon the screen (Firefox uses a Gecko engine with a release date of 01 JAN 2010). It looks like this when you see it: [Mozilla/5.0 (Windows NT 10.0; WOW64; rv:65.0) Gecko/20100101 Firefox/65.0] -- sometimes it is surrounded with brackets and/or parentheses to differentiate the beginning and end of the User Agent text, but when or if you edit this field you have to follow the specific guidelines for each OS platform to "spoof" or fool the server you are going to or are connected to so that you can achieve what you are trying to accomplish (in this case it is downloading the Windows 10 .ISO files so that you can perform an off-line installation of the Windows 10 system updates). You can edit it manually, but it is a royal PITA to keep accessing the about:config, then finding the User Agent string and re-typing and re-editing the field when you are done. You just cannot leave the User-Agent field in the "spoofed mode" because of some websites (like Microsoft's off-line windows update page, for example) will and could only display operating system specific options, codes, information, etc. based upon the User-Agent information that is presented to the website's server(s) just before the webpage's information is presented to you for viewing. So it must be changed back to your system's current parameters in order to do due diligence to your OS and your current system's setup, survival, and health. I use a Firefox web-extension called User Agent Switcher, this is what allowed me to download both the April and October 2018 Update ISOs. The User-Agent "told" the Microsoft server for the Windows 10 download page that I was using a Linx OS and Firefox version 62 when I was really using a Windows 10 OS with Firefox version 65.0b3. If I did not change the User-Agent to "spoof" or fool the Microsoft Website into thinking that I was using a Linx version of OS I would have been told that I would need to update my Windows computer via the Windows Update feature of my Windows 10 OS. This is why it is very important to make sure that once you are done what needs to be done with the changed User-Agent -- you change it back to your current system's OS settings. Finally, once you change the User-Agent amke sure you REFRESH your browser's tab so that the website you are viewing can reflect your "spoofed" changes. ALSO, YOU MUST CHOOSE THE CORRECT WINDOWS 10 VERSION YOU HAVE INSTALLED!!! DO ** NOT ** EXCHANGE ISO UPDATES!!! AN ISO THAT IS MENT FOR A WINDOWS 10 PRO INSTALLATION WILL *NOT* WORK WITH A WINDOWS 10 HOME EDITION INSTALLATION -- YOU WILL HAVE ERRORS AND ISSUES! Lastly, if you are downloading ISOs for different versions of Windows 10 "flavors" (PRO/HOME/N) the filename of the ISOs may not be a way that you can or could differenciate between them ISOs are like ZIP or 7-ZIP files, they CAN be renamed to something that you can remember easily. Has anybody noticed that these instructions are for installing Build 1803, NOT 1809. MS, how about tweaking these instruction so they are relevant to 1809?